Kamp Amersfoort regularly receives grants for various educational projects. 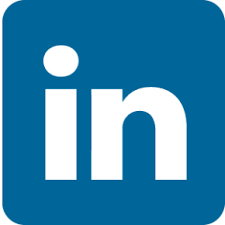 To receive funding we apply for grants from various funders, including the VFonds, Mien van ’t Sant Fonds, Nationaal Comité 4 en 5 mei. Recent projects are ‘Historical Stories’ (Historische Verhalen) and ‘Children of the Past’ (Kinderen van Toen). 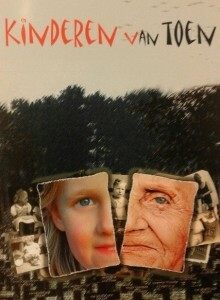 A website and documentary were developed for the last-mentioned project, www.kinderenvantoen.nl. 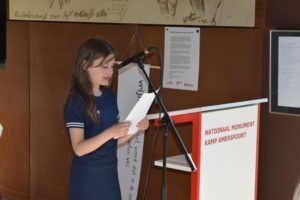 On April 21st the awards ceremony for the winning poem in the Historical Stories project took place at Kamp Amersfoort. Groups 7 and 8 of primary schools in Soest joined in the project. They read the book ‘War without a father’ (Oorlog zonder vader), visited Kamp Amersfoort and wrote a poem. The book ‘War without a father’ was written by Martine Letterie. The students of groups 7 and 8 read the book and met the author. The book is about her father. During WOII his father was arrested and brought to Kamp Schoorl after which he was brought to Kamp Amersfoort. After Kamp Amerfsoort he was transported to Kamp Neuengamme where he died. Martine Letterie talks about being an author and how she came about writing this book. The students visited Kamp Amersfoort where they learned about the imprisonment of Martinus Letterie (the grandfather of Martine). After their visit the children had to write a poem on what freedom means to them. A jury existing of someone from Kunst Centraal, Kamp Amersfoort and a poet chose their favoriet poem. The winner came to Kamp Amersfoort with his or her classmates where he or she received a price, a book by Martine Letterie. The project was initiated by Kunst Centraal in cooperation with IDEA and Kamp Amersfoort. The winning poem was written by Tuula Heyden, a group 7 student of the Ludgerusschool.